Arguably the most liquid futures contract in the world, the Eurodollar futures contract owes its success to a very large user base and an underlying market (3-mo LIBOR money market and forward rate agreement markets) that is staggering in size. That large user base consists of traders, asset liability managers, interest rate hedgers and spread traders. This module will cover the basic spread strategies used in Eurodollar futures including calendar or yield curve spreads. The yield curve is simply a plot of yield versus maturity. Generally, as maturities increase, yields also increase due to the added risk of holding a fixed income security over a longer period. For example, 3-month Treasury Bills currently yield .60% while the 2-Year Treasury Note yields 1.25%, the 5-Year Note yields 2.07 and the 10-Year Note yields 2.54%. 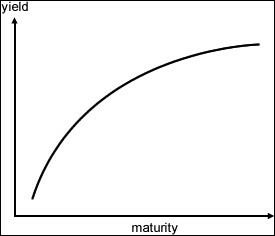 If you plot yield versus maturity, you get a curve known as the yield curve. You could also plot 3-month LIBOR, 6-month LIBOR, etc. and generate a similar yield curve across the 40 expirations of Eurodollar futures. Sometimes yields rise at a greater pace in certain areas of the curve than others. For example, short-term rates might rise faster than long-term rates, contributing to a flattening of the yield curve. Or long-term rates might go up faster than short-term rates, contributing to a steepening of the yield curve. Traders can take advantage of changes in the yield curve using spread strategies in Eurodollar futures. Spreading in Eurodollar futures is one of the most popular strategies among Eurodollar traders and involves the simultaneous purchase and sale of futures contracts of different maturities. The hope is your profitable leg of the spread makes more than the unprofitable leg loses. Spreading can reduce risk because you are simultaneously long and short. But remember, not all spread trades are profitable. They may reduce risk but they do not eliminate it. Calendar, or Yield Curve, spreads are one of the most common Eurodollar trades at CME Group. Since the value of one basis point is $25 in all the quarterly Eurodollar futures, the ratios for Yield curve spreads are 1:1. Flattening Yield Curve Strategy: Sell the shorter maturity Eurodollar future; buy the longer maturity Eurodollar future. Remember: Prices move inversely with yields in Eurodollar futures. Choose a Steepening yield curve strategy when the market anticipates long-term interest rates will rise faster than short-term rates or long-term rates remain steady while short-term rates fall. The rationale: a perception is that the economy remains weak and the Federal Reserve is expected to do nothing or to lower interest rates. When the Fed does this, it usually affects short-term rates more. Choose a flattening yield curve strategy when the market anticipates short-term interest rates will rise faster than longer-term interest rates. The rationale: economic news and events surprise market and economy is expected to strengthen further and the Federal Reserve is expected to raise short-term interest rates to head off potential rise in inflation. 01/25/17 98.90 97.56 134 b.p. The trader in the example above bought the spread in January at a difference of 134 basis points from the March 2017 and March 2020 contracts. He wants the spread to widen by either longer rates going up more than shorter rates or shorter rates rallying relative to longer term rates. By March of 2017, the spread widened to 186 basis points a gain of 52 basis points. To calculate his profit, each basis point = $25.00 in Eurodollar futures. Hence: 52 bps X $25.00/bp equates to a profit of $1,300.00. There are many more types of futures spreads in Eurodollars including butterfly spreads, packs and bundles.